This post describes the configuration of an ejabberd XMPP server running on an Amazon AWS EC2 instance as a first step to building a cluster later on. Launch an EC2 instance in the desired configuration. In order to stay within my Free Tier, I chose the smallest available configuration using EBS and running Amazon’s custom Linux image. Configure the security groups for the newly created instance. We need to allow SSH-access as well as open the ports used by XMPP/ejabberd. In default configuration, ejabberd is using TCP ports 5266, 5280 and 5269. Connect to your instance using SSH. To download and run the ejabberd installer enter the following commands. You can find the URL to the latest ejabberd release on their commercial website http://www.process-one.net. Make sure to check whether your instance is running a 64- or 32-bit OS and choose the corresponding installer. Choose the language you prefer and read and accept the license agreement. Confirm the default directory /opt/ejabberd-13.12 . As ejabberd server domain, enter the public DNS of your instance e.g. ec2-###-###-###-###.eu-west-1.compute.amazonaws.com. Select whether this instance will become a node of a cluster. As building a cluster will be covered in another blog post I will not go into detail here and select no for this step. Use sudo /opt/ejabberd-13.12/bin/ejabberdctl register username host password to create new users. Users can connect to the server using any XMPP compliant client now. Please note that I only tried a few popular clients like Pidgin on Linux and Windows and iChat on OSX. As your server doesn’t have a valid certificate, the client will most probably show a warning and requests the user to confirm a security exception. I noticed that Thunderbird Chat will deny any connection to a ejabberd server running in a default configuration like this due to improper security configurations. To shut down the server again, use sudo /opt/ejabberd-13.12/bin/ejabberdctl stop . To compare impacts of different optimizations in terms of rendering duration, it can be useful to implement a frame timer. A frame timer counts the amount of time that elapsed during a paint() call. Since version 3.3 OpenGL provides the GL_TIME_ELAPSED query which returns the time between to calls in nanoseconds. The code below shows a very basic example in plain C/OpenGL. Since the availability of those queries depends on the underlying platform, hardware and OpenGL version, Qt provides QOpenGLTimerQuery as a wrapper class for that functionality. The same code for the use within a QGLWidget can be seen in the following snippet. This post is part of a series documenting the progress of the development of a OpenGL/Qt/C++ based application for my fast realistic rendering course at the Universitat Politècnica de Catalunya. The complete source code can be found on github. In order to implement some visibility algorithms later on, it is useful to calculate a more simple representation of the meshes. The most basic way to do this, is to define a box with the size of the actual mesh’s maximum dimensions. 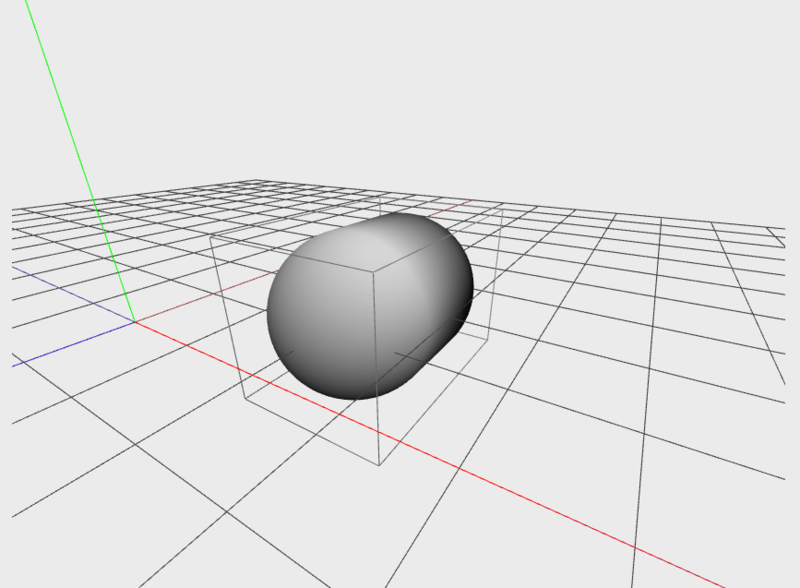 Also, for a first try, the bounding box will be axis-aligned which makes it easier to compute. Iterating over all vertices of the mesh allows to retrieve the minimum and maximum dimensions on all three axes. In the following code snippet the vertices are stored in a QVector<QVector3D>. The x, y and z components can be accessed via the corresponding methods x(), y() and z(). The retrieved dimensions can be used to calculate a bounding box for various visibility algorithms. To render the bounding box over the object in the actual scene, the glBegin(GL_LINES) command comes in handy. The next code snippet shows how to render the four lines in the front (z+).